The club was founded in 1985 and has approximately 200 members total in the Adult and Junior sections of the club. 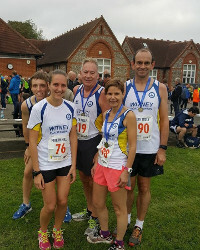 Our objective is to promote the sport of athletics in all its forms within the Witney and West Oxfordshire area and to provide coaching and training in a sociable and structured atmosphere within the facilities available to the club. We are affiliated to SEAA/EA/UKA and OAA. Although we have some serious runners who compete, we also have a large group of members who turn up simply for the opportunity to get fit, meet new people and attend our social events.